Fiona Bruce and the team set up for another busy day in the grounds of Hever Castle in Kent. Items include one of the finest pieces of furniture seen in recent years. Browse content similar to Hever Castle 1. Check below for episodes and series from the same categories and more! This week we are at Hever Castle in the beautiful Kent countryside. one of the most famous and fascinating women in English history - Anne Boleyn. brings us to some remarkable historic houses across the country. because it's here that you can get closest to Anne Boleyn. Anne Boleyn on their wedding day in 1532.
and so change the course of British history. Not long after, their only child, the future Elizabeth I, was born. And then, after just 1,000 days as Queen, Anne was executed. it's sometimes hard to find the real Anne Boleyn. but we don't know what she looked like, for example. Is this her? Or this? Or this? And when was she born? was she an ingenue of 18, or a sophisticated young woman of 25? that magical direct link to Anne herself. This is Anne's prayer book. with their dense type and beautiful illustrations. used to write little notes to each other, in their prayer books. "Remember me when you do pray, that hope doth lead from day to day." And there's her signature just at the bottom there. which bring history to our fingertips. This looks most intriguing, all I can see is a little hand. Who's is this? This is Monty, my dog's rug. -Well, how does he feel about this? -He's not very happy about it. Let's see what it's wrapping up. My goodness, that's wonderful, isn't it? This is where I get a hernia. I wonder who she's by. Is it signed anywhere? Yes, just down here, just there, look. Oh, yes, there we are. Lefebvre. Hippolyte Jules Lefebvre. And how did you come by her? She was left to me in a will. down the road and she was on her own, so I used to keep her company. And when she passed away, she left me in her will. How very nice, and was it on this as well? Gosh, you must have been a favourite neighbour. -You made good tea, excellent. Strong or weak? -Well, it obviously kept her going for a while. -And what do you know about her? but we can't find out a lot about her, which is why I'm here. -and I think this is certainly pre-First War. So, sort of circa 1910ish. And it's so elegant, isn't it? -I haven't plugged it in. You haven't? Because it does look like Monty may have chewed this. No, it wasn't Monty, it came like that, but I haven't plugged it in. I have been told it could be rewired, but I didn't want to touch it before I had it valued. -But I think you ought to, certainly if you intend to light her up. And it wouldn't be impossible to get more glass beads as well. That's what I wanted to do, I wanted to sort of renovate her. -I think it would be a great thing. -I think she'd be really beautiful. -certainly £2,000 and possibly even as much as £3,000. It's a really beautiful bronze. And I do think that you should have it rewired. Renovated. That won't make a difference to the price, will it? I don't think so. And you simply can't use it at the moment. -I think it would be lovely if it was all up and running again. This is an absolutely stunning spoon. Do you know what it is? I know it's a caddy spoon. -this is one of the best caddy spoons I've ever seen on a Roadshow. Do you know anything about its history? Only that my father had had it for a number of years. He collected silver and this was one of his favourite pieces. but don't know a lot else about it, really. There are three ways in which caddy spoons tend to be made. or they're cast, which is the best way, and this is a cast one. this fabulous swan's neck handle here. any signs of wear on it at all, so it's in wonderful condition. -is really, really hot for great, rare spoons like this. And if we have a look in the bowl here, it's got some hallmarks. IW. That's for James Wintle, a well known spoon maker. great rarity and actually quite valuable. -Mm, I'm afraid it is! I would comfortably say we're looking at probably £1,500 to £2,000. No! Goodness me, I had no idea. are you an old rocker, to posses a portrait of Mick Jagger? Well, I am, but I'm afraid I don't possess it. -I've brought it today on behalf of my employer. Right. Is he a rocker? and antiquities of one sort or another. took it home and it's had pride of place on his studio wall ever since. considering he wasn't perhaps into contemporary music of the time. and this is by Cecil Beaton. and as a stage designer. -he is a seriously good painter as well. those cheeks and that incredible look that Mick Jagger has. I think he's captured it very well, of course. And I like the way he's brought it very close. and what a great painter he is. So what did it cost in 1966? I believe it was in the hundreds, so I understand. -The hundreds, quite a lot of money. -Quite a lot of money in those days. Yeah, so I think I would insure it for £30,000. That is a significant sum. It is, it's a good sum and I think it's worth every penny. when he gets back from holiday. He'd better go again on holiday with the proceeds! -Good, thanks for bringing it. What do you think of these? Are they nice, or not? -Be honest with me, are they fetching? -Well, it's not doing a lot for me. -It's the latest Roadshow attire for a rainy day. But we're enjoying ourselves nonetheless, aren't we, Geoffrey? -and what more could you ask, even in the wet weather? -You see, it's all going to be fine. on this show, but, boy, does this take the biscuit. But it was apparently buried in the sand at Herne Bay. And that's all we know about it. We wondered where the Loch Ness Monster had gone! It ended up in the sand at Herne Bay. I mean it's a real shame its wings have gone. And it's an incomplete object, and so...you know. A bit of wacky, I just love it, but it's probably worth about four quid. On the other hand, you also brought that in. -And what's the story of that? -Did you know it was made of glass? and is a really lovely academic antique. production of glassware to finance the army to fight back the Scots. just at a time when English porcelain was coming in. it's not very good but it's extremely expensive. So this is an imitation of English china, but it's made of glass. and it probably dates to about 1755-60.
little gem that's 250 years old. And is worth £600 to £800. No way! Well done, Auntie, wow. I thought, "This is quite extraordinary." because it's got quite a monumental character to it. extremely valuable, and only found in the Laconia region of Greece. this table was made to fit the marble. equal in value to the porphyry on the top. can you fill in the background of this table a little bit? in the late 18th Century, early 19th. And they came back to the UK, in about 1802, I think. -bringing the Elgin Marbles back? which I thought came from upper Egypt, but you say Greece. and so that's the way things happened in those days. Well, that is extremely interesting, because you mentioned the date 1802.
of a house which became very famous. and from which much Regency design was to spring. and his house had a series of rooms, all of which had a different theme. because he'd been to all these places. and this table speaks to me of the style generated by Thomas Hope. There's very strong Classical influences in it. and then these anthemia, half anthemia scrolls. monumentality which is very Classical. which was the introduction of stamped brass inlay. And you have a lot of that on this little table in different patterns. you have it on the frieze in a different pattern. And once more on the base, in this delightful little lacy pattern. And this was a new technology, being able to stamp brass. It's often associated with a maker called George Bullock. and this table speaks to me of that sort of quality. It's a very, very top quality table, it's extremely exciting. Now, you've had it in the family a long time, have you had it valued? I don't think I'm being over optimistic to say £20,000. Really? Yeah, well, it's not going to be sold. that's not insurance value, that's a sale value. I have to... I'm not known for giving high valuations. it's the best piece of furniture I've ever seen on the Roadshow and I'm absolutely thrilled. Well, thank you very much. I'm overwhelmed. it was her grandmother's, so that's all I know. That's all you know. You didn't ask her any more questions? unfortunately, and too late to go back and ask her now. Yeah, we always wish that we'd asked more, don't we, at the time. in the garden, but at least we've got this one. -known as the Art Nouveau period. when you have a brooch like this, that if you touch it, it moves. so it's a lovely movement to the actual piece of jewellery. just shines through and all the colour is beautifully picked up. As it would have done, when it was worn. Sometimes brooches like this were also worn in the hair on a hair comb. and pieces of Art Nouveau jewellery. but his pieces do appear and are very popular. Well, for me, the 1930s are what I like to call the age of elegance. I mean, this really is elegant. Something you live with every day? Yes, it's in our bedroom. -I saw this as well. -And this is all there was? This was all that there was there, yeah. a much larger bedroom suite. Fabulous dressing table, brilliant bedside cabinet. where they're really experimenting with streamlining. The machine age has come to be and everything is becoming so elegant. to actually the mysterious Orient. here which has echoes of Chinese about it. they actually called it "the Paris of the Orient". But where does this come from? because this kind of furniture was sort of being manufactured all around the world. has it come out of that French School of furniture making? Is it American? -and all these forms, and I straightaway think of those chrome American diners. is that it's got the most fantastic style. everything that is the essence of that period. It's just knock out, absolutely knock out. So, I have to ask the question, what did you pay for it? I paid, I think it was about 150 quid at the time for it. I think you will see a ten-fold increase. I think this is worth the best part of £1,500. It's a great, great set and something that I seriously covet! Thank you for bringing it along, it's wonderful. This is certainly one of the smallest books I've seen today. lovely in its own way, but look at this binding, isn't that gorgeous? It is nice, very nice. I think that's a 17th-century binding. but all the more beautiful because it's in miniature. How difficult it would be to create something like that. and there was a market in Kendal and my mother purchased this. How long ago would that have been? Well, I think it's probably about 20 years ago now. Let's open it up and have a look at it. Well, I have to say, from the title page, I'm not very much the wiser. It's just a series of hieroglyphics here. and it does look like a 17th Century book. -says 17th Century to me. "under the Crown Tavern in West Smithfield." and really I'm absolutely none the wiser, from the text. -Do you have any ideas? Well, I assume it's a sort of Bible. I think it is a Bible, and I think it's a Bible in shorthand. the system of shorthand that we still just about remember today. And so that's what makes this so interesting. -it went right the way back into the 17th century. -Why a Bible in shorthand? What would be the point of such a thing? -as a kind of show-off piece. I think it's a piece of advertising. this tiny little volume which fits in the palm of the hand. it would have to make £1,000, maybe £1,500. Gosh, good gracious me! Yes, yes. but are poles apart in terms of value? one is a better one worth £1,500. and then the best one is worth a jaw-dropping £10,000. I'm going to chat to our visitors and see if they can help me. -It is really unusual to find one of these. -I've never seen another one. Well, you have seen another one - we've got nine here in all! we were allowed to play with them. But when I had my three children, I didn't let them play with them. That's very sensible of you actually. Some would say mean, but I think very sensible. that's 1911 and they would have been new for him then. I would imagine so, yes. Was the family well-to-do? What was their...? No. Just an ordinary family. -Do you know what they bought him? Do you know who made these? -Have you ever thought to look in their ears? -You've never looked in their ears? So you've never noticed that they've all got a little stud in their ears. -What do you think...? Do you know what the stud means? That it's a Steiff...Sieff bear? and they first appear in the catalogue in 1897. Not this particular set, but as a range. who is known as King Ping - P-I-N-G. I don't know, but anyway there he is in all his finery with his crown. so they've only had one careful owner, well, two now with you. -Do you have the balls that go with it as well? -Did you have them when you were a child? I don't think it's going to make a huge difference actually. They were really expensive in their day, these sorts of things. -And they're still very expensive. -Somewhere around £8,000 and £10,000. I think this is the basic. ..and this is the best. I'm not sure. Actually I'm going to change my mind, I think. -Yeah, I think, so, yeah. She really sounds like she knows what she's talking about. -that was better suited to an owner. Tell me about it, who chose it? But this is absolutely the most marvellous thing for me, personally. The maker of it was a speciality of mine throughout my entire career. from a premises in Piccadilly, 115 Piccadilly. He was there from 1874 until 1895 when he died. and it's loosely in the Egyptian taste. This is a sort of Nefertiti looking necklace, isn't it? absolutely typical of Giuliano's work. What do you know about Giuliano? -and passed it on to his two sons. and I'm just wondering why would he not sign some of his pieces? and it might have been a race in the workshop to get this out. I can recognise the chain work from which it's suspended. but they wanted something that had some sort of academic background. Giuliano was frequented by Queen Victoria and by most of her family. took it to Giuliano's shop to have it assayed and weighed. Edward Burne Jones went there to have jewellery designed. which was to look back. This is a revivalist jewel, it's drawing on earlier sources. And the strongest possible source is ancient Egypt. It's nothing about intrinsic value. or indeed why it's valuable today. And it's your taste? I just think it's so pretty. -so I just love it. -Well, it is perfect for you. Throw the necklace away and keep the girl! OK, oh, well, thank you! Fantastic. But we have to deal with the necklace. which frankly was in question. for this to fetch £15,000 and possibly even £20,000. It's only gold, its melt value is measured in low hundreds of pounds. and it's fallen, may I say so, very happily on you. I've got to pass it on and I've got three granddaughters - what do I do? -Big problem, get two more necklaces. -Easily done, wonderful. Thanks so much, brilliant. We've been setting our visitors, and you at home, a bit of a challenge. and the best worth no less than £10,000? almost everybody had a different idea...about which was which. -Now what should we be looking for? that you value as a collector, or as a practical object. almost universally worthless in this country is we stopped decanting wine. but we're drinking it out of a horrid bottle that we plonk on our table. We're plonking our plonk on the table and it's horrid! but now, as you say, we don't do that any more. simply by the act of decanting it. now they're not worth very much. -We know one of these is worth a stonking amount. -and something that's really significant? as you and your visitors have found, it's not easy to suss it. Are they? Because I thought there was a significant difference in age. There's a 30-year span in here. -They're all 250 years old, as it were. So, striations... Look at the age of that. I mean, look how wonky donkey, all over the place that is. as opposed to glass today that's made in a microwave. then the ease of glass making has changed. -The technology allows perfect crystal. -the kind of thing you see in a shop these days. and thought this stopper doesn't go with this decanter. It's the wrong stopper, look. -The style is all wrong. and most of them have a stopper that doesn't fit and a little chip there. I put this as the best one because it looked the most basic actually. It was the most valuable and I thought the stopper was lovely. Fiona, Fiona, let me put you out of your misery. -You got this one right. -But you got those two wrong. -Right. So talk me through then. Why is this the most basic, is it because the stopper doesn't fit? Because the stopper doesn't fit. It's also... This is a pretty good thing. I mean £1,500 for a decanter in Britain today. I mean, that's very unusual, you're talking cream here. It's just that we're talking extra cream with added champagne here. So why is this one so fabulous? Oh, this is a rare, rare thing - Jacobite. It is an absolute blinder. This was used by the Jacobites to toast the health of Bonnie Prince. This is a £10,000 decanter. why not pour your wine from a decanter? I hope that you've got some idea now what to look for. and the differences between them on our website, so have a look. What are you going to do with Green and Bohea? Well, hopefully tea would have been kept in them at one point. I don't know what bohea tea is. -Bohea was black fermented tea. -Which is the tea we drink today really. which was controlled by women. Up to that point, it was men. and the lady of the house did the stuff. And the impact was extraordinary. It altered all the furniture. You had to have special furniture. You had light furniture so you could pick it up and move it round. and she would have her tea tray with teapot, milk jug etc. which would go to the teapot. And you were judged really on how well you did it. You know...everybody's watching and thinking, "Hmm, not bad." Slightly different from just putting a teabag in a mug. -It's very sad, the teabag, although of course everybody does it. Do you know what these are made of? -I understand they're actually made of some sort of glass. -Yes, they look like porcelain. where the scar, or pontil mark, is. while they were being formed. They come from south Staffordshire. And that is transfer printed. which you would not normally expect to find, but anyway we have. They date from about 1770. -Yeah. Older than you thought? Well, yes, much older than I thought. I had no idea. Yeah, and they're quite influenced by Meissen actually. are very Meissen in style. I love this white glass. which you find in no other way. Oh, I mean, these are wonderful! God, those are good. I mean, they don't get any better than this. ..£12,000 to £18,000 to replace them. Oh, my goodness. Are you being serious? -I am fairly. Yeah, absolutely. They are top of the range. Gosh, thank you very much. They don't get any better than that. My mother, to whom they belong, is going to be very pleased at that. Sit her down. Give her a cup of tea before. -Thank you very much, thanks. It's been one of those days on the Roadshow. ..yeah, it's stopped raining and we've come full circle. until next time, come rain or shine, bye-bye. 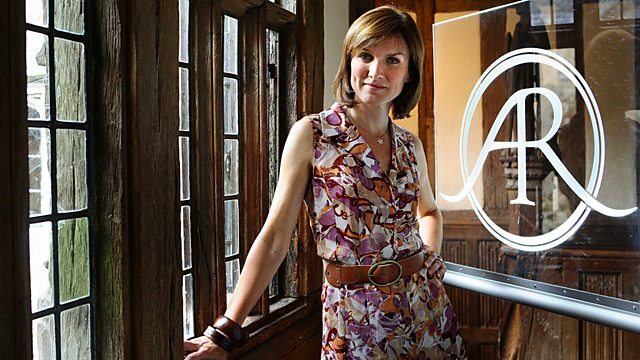 Fiona Bruce and the team set up for another busy day in the grounds of Hever Castle in Kent. Despite occasional downpours, thick crowds unpack their heirlooms for the experts. Items include one of the finest pieces of furniture seen in recent years, with an important table from the early 19th century ,and a painting of Mick Jagger by Cecil Beaton from the 1960s. And a strong cuppa is required by the owner of a pair of some of the earliest tea caddies ever seen on the show.